Stockbridge, MA, July 5– Norman Rockwell Museum announces the loan of Norman Rockwell’s iconic painting “The Problem We All Live With,” part of its permanent collection, to The White House, where it will be exhibited through October 31. 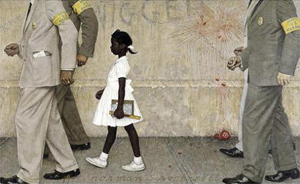 The loan was requested this year by President Barack Obama, in commemoration of the 50th anniversary of Ruby Bridges’ history-changing walk integrating the William Frantz Public School in New Orleans on November 14, 1960, that later inspired Rockwell’s bold illustration for the January 14, 1964 issue of “Look” magazine. 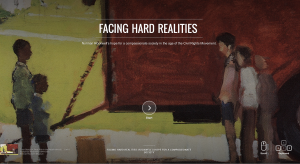 “The Problem We All Live With” was the first painting purchased by Norman Rockwell Museum in 1975. The White House loan was made possible through the support of the Henry Luce Foundation. Ruby Bridges’ historic walk took place six years after the 1954 United States Supreme Court Brown v. Board of Education ruling declared that state laws establishing separate public schools for black and white students were unconstitutional, and represented a definite victory for the American Civil Rights Movement. Among those Americans to take note of the event was artist Norman Rockwell, a longtime supporter of the goals of equality and tolerance. In his early career, editorial policies governed the placement of minorities in his illustrations (restricting them to service industry positions only), however in 1963 Rockwell confronted the issue of prejudice head-on with one of his most powerful paintings–“The Problem We All Live With.” Inspired by the story of Ruby Bridges and school integration, the image featured a young African-American girl being escorted to school amidst signs of protest and fearful ignorance. The painting ushered in a new era in Rockwell’s career, and remains an important national symbol of the struggle for racial equality. Ms. Bridges Hall, who founded The Ruby Bridges Foundation in 1999 to promote the values of tolerance, respect, and appreciation of all differences, commends Rockwell for having “enough courage to step up to the plate and say I’m going to make a statement, and he did it in a very powerful way.” Learn more about the Ruby Bridges Foundation at https://rubybridgesasingh.weebly.com/ruby-bridges-foundation.html.